So in a post of mine the other day I spoke of some crazy witchcraft called “trend lines” and described how they are basically slanting support and resistance levels.. Well after thinking about that today I feel as though I may have missed a step, with having not gone over simple support and resistance levels to begin with. Levels can be found rather easy with the naked eye after a little practice. But with your charting software, sometimes it helps to use a cross hair or horizontal lines to make these areas of price rejection more visible. Remember now, an area where price gets rejected (rises to then falls back down) more than once could very well be a “resistance level” Resistance levels show areas in the market where the bears (the sellers) are far out numbering the bulls (the buyers). I spoke briefly in a previous post of what happens when a trend line is broken, that price may very well drop or rise steeply or steadily in that direction. The same idea of the way price moves after a trend line is broken holds true for support or resistance levels as well. I noticed an example of this while I was trading today and I wanted to share it with you all. It may not be the most clear cut level in the world, but none the less, one can see that price entered this “zone” (which I marked with two horizontal lines) and became stuck there for some time. Price seemed to turn around constantly around the same highs and the same lows, however what I want to draw attention to, is on the far right when price finally CLOSED BELOW this area. 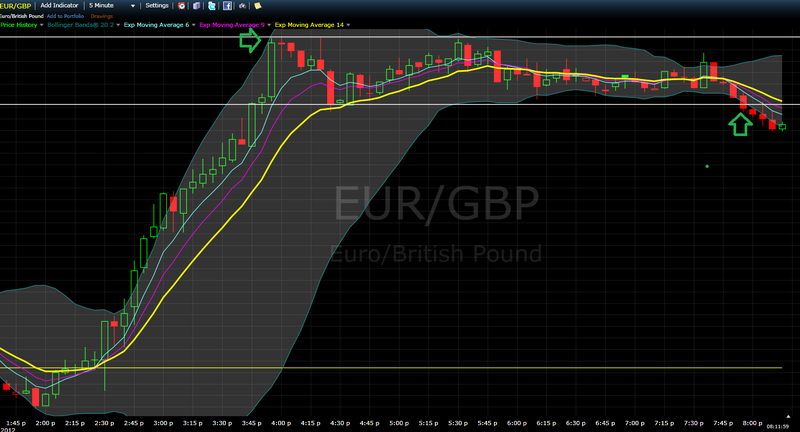 After breaking out of this area you can expect price to continue in that direction, which here was down on the eur/gbp. Price at this moment as I write this is STILL dropping and at 0.81350 with no signs of rising yet. So pay attention to these “break outs” they can signal the start of a new trend and very important to pay attention to.